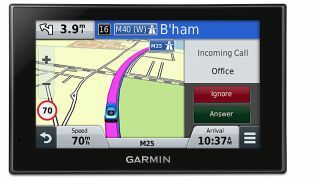 Ousted from the front window of your car by cellular devices, GPS maker Garmin has had to turn to some new sources of income, including a wave of fitness trackers and action cameras. Another of those targets, it turns out, is your old HDTV. First spotted by Liliputting, Garmin is well under way on the development of a smart TV stick that it's calling the Vivohub 2. As you might've noticed by the picture below, it's similar to the original Google Chromecast, the Amazon Fire TV Stick and Roku Streaming Stick. The device is reported to run Android 4.2 Jelly Bean which, considering Android 5.0 Lollipop has already been available for the past few months, seems anachronistic. Inside the stick you'll also find a 1 GHz Amlogic AML8726 dual-core ARM Cortex-A9 processor with ARM Mali-400 graphics and 1GB of RAM, plus 802.11b/g/n Wi-Fi and Bluetooth to connect to your home network and other devices. The biggest surprise - outside of the streaming stick's very existence - is that Garmin chose to run the mobile version of Android instead of Android TV that Sony TVs, the Nexus Player and Nvidia Shield use. Want to get gifts at the best price this holiday season? Check out our Black Friday Deals page!